Another little girl has captured my heart. And this one has come adorned as well. There is no information as to who she might be, but she certainly deserves a closer look in the Photo Of The Week. (1) The card measures 2 1/2 in. (w) by 4 3/8 in. (h) and is 0.03 in. thick. The image measures 2 1/4 in. (w) X 3 1/2 in. (h). The corners of the card are rounded with gold beveled edge. The card stock's original color appears to have been cream (matte finish) for the front and back. There is no border line. The ink used to identify the photographer was originally red. (2) The photographer’s imprint on the front (recto) lists the photographer as C.L. Hunt, Jeweler and Photographer, Franklin Falls, N.H.
(3) The back (verso) of the card is blank. (4) Props - A single small dark tufted chair made of a shiny fabric with carved grapes in the wood above child's head. Jewelry - Necklace of what appears to be pearl/pearl like beads and large stones. (5) Portrait Sitter - Child with short dark hair parted in middle with bangs. Approximate age 1 - 2 yrs. White mid-calf length dress, light in color, long sleeve, eyelet trim on yolk and hem, striped socks, dark suede or leather boots just above the ankle. The Carte de Visite was introduced into the United States in ca. 1859. The Carte is a small card mounted photograph, most often a portrait. The photograph was mounted on a card that measured approximately 2 1/2 X 4 in. As the image was cut and trimmed by the photographer, the image size varies, but is usually 2 1/8 X 3 1/2 inches. This card and photograph are a little larger, but are reasonably consistent with, and as such may be identified as a Carte de Visite. The photograph is therefore most probably no older than 1859. Props as a bridge, fence, fake rock, etc. Single border lines, or absent. Gold beveled edge on mount. Photomontage, such as oval portrait surrounded by actual photo of a forest. Elaborate backdrops, outdoor views, etc. This card fits most appropriately in the period 1880 - 1905, because of the introduction of the gold beveled edge mount not evidenced prior to 1880. C.L. Hunt is Clarence L. Hunt, who began his career as a jeweler at the age of thirty, in Franklin Falls, New Hampshire. It was not uncommon in the early days of photography for a photographer to have or have had another career. The most common prior profession was that of artist, painters in oil, crayonists and watercolorists. Most early photographers considered their work with the camera an art form and fashioned their subjects after famous paintings and techniques. There is documentation that some photographers were morticians, chemists and dentists (I have often thought the photographer's chair closely resembled that of a dentist's). Research has produced photographers who were jewelers as well as photographer's, but I have never found a photographer's imprint that advertised this dual profession. I have never found a photographer's imprint of a dual profession of any kind, until now. This dual designation will be of assistance in dating the Photo Of The Week. A call to the Franklin County Library and a request for a search of the Franklin Falls Directories for the years 1880 to 1910 produced the following information for Clarence L. Hunt's businesses in Franklin/Franklin Falls, New Hampshire. 1881 – Business: Watch & Jewelry Business Address: Central St. Residence: High St.
1882 - 1887 - No directories in library. 1888-1889 – Business: Jewelry & Photographer Business Address: Central St.
1890 - 1893 - No directories in library. 1896 - 1901 - No directories in library. 1903 - 1909 - No directories in library. 1910 - Business: Photographer Business Address: 22 Thompson Park Residence: 30 Thompson Park. The 1880 census lists C.L. Hunt as a jeweler, the 1910 census lists him as a photographer as does the directory. The Library does not contain directories for the years between 1881 and 1888; and 1889 and 1894. There is no census information for 1890. So we can determine from the photographer's imprint that the photograph was taken between 1882 and 1894. A span of twelve years. Both boys and girls wore dresses as infants and toddlers during the period addressed here. For the most part the dresses worn by boys were plain in comparison to those of girls. (Please do not take this as a hard and fast rule. The first time we do we will have misidentified the exception.) This is just one step in the identification process. Even though Victorian fathers had no problem with a son wearing a dress (convenient for changing diapers), I have yet to see jewelry such as this worn by a boy. I am assuming for the sake of this discussion that this sitter is a girl. The necklace being worn by the little girl, after much research, appears to be from the period 1875 - 1885. Caution - while the necklace may be from this time period it could have survived long after. The necklace puts us in the correct time period, but does not narrow our span of years in dating this photograph. It may, however, lead us to another conclusion regarding the photograph. Little, if anything, was left to chance in a formal Victorian portrait photograph. (The Victorian Period revolves around the rule of Queen Victoria. She was crowned in 1837 and died in 1901. It was preceded by the Regency Period and was followed by the Edwardian Period.) Rites, celebrations and symbolism were depicted in the photographs of the era. The prominent display of the necklace in this photograph may be a clue. Was this an advertisement used by Hunt for his Jewelry business as well as his Photographic Studio? Photographers often used Carte de Visites as business cards and advertisements. I have CDVs and Cabinet Cards in my collection that were in fact advertisements. Hunt may have been doing just that with this card, as this little girl is wearing a beautiful piece of jewelry. In past Photos Of The Week there have been young women and children of this time period wearing jewelry. However, our little girl looks a bit young for the large necklace she is wearing. Was the young girl the photographer Hunt's daughter? The answer is no. In the 1900 census Clarence and Vinnie have been married for twenty-three years and have had no children. Clarence was born in October of 1852 and Lavinia/Vinnie was born in June of 1846, making Clarence 47 and Lavinia 53 years old at this time. It is doubtful there would be any children born to this couple after 1910. And none born to them for the period of time we are attaching to this photograph, 1882 - 1894. There were no neighbors with a young female child of the approximate age living near Hunt's home. Both Clarence and Lavinia had brothers and sisters. An in-depth analysis of the two families could produce a niece who sat for the portrait, but that is outside the scope of this article. We may never know. 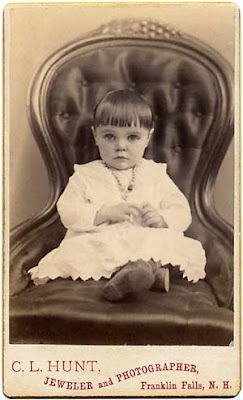 She may have been an extremely attractive child who came to the photographic studio for a portrait and Hunt convinced the family to allow him to use her for advertisement. He may have gone looking for an attractive young girl to use as an advertisement. The necklace may have been used to entertain a petulant child and not be an advertisement. Maybe it was just a portrait. Again, we may never know. What we do know is that this is a charming Carte de Visite portrait of a young girl wearing jewels and the perfect Photo Of The Week. Ettinger, Roseann. Popular Jewelry 1840 - 1940. Schiffer. 2002. 1880 U.S. census, Merrimack County, New Hampshire, population schedule, Franklin Falls, p. 279, dwelling 201, family 263, Clarence L. Hunt (Head); digital images. Heritage Quest (http://persi.heritagequestonline.com/ : retrieved 20 July 2008); citing NARA microfilm publication T9, roll 766. 1910 U.S. census, Merrimack County, New Hampshire, population schedule, Franklin Falls, p. 139, dwelling 160, family 217, Clarence L. Hunt (Head); digital images. Heritage Quest (http://persi.heritagequestonline.com/ : retrieved 20 July 2008); citing NARA microfilm publication T624, roll 864. This is such a lovely, charming photograph. I absolutely love following your research and deductions which you write so wonderfully. A great treat, as always. I see why she had become a favorite. Those EYES are amazing! Thank you for sharing her. What a beautiful photograph of a beautiful child. Thanks --- hope you get this one identified too!